Prehistoric man navigated his way across England using a crude version of sat nav based on stone circle markers, historians have claimed. New research suggests that they were built on a connecting grid of isosceles triangles that ‘point’ to the next site. Many are 100 miles or more away, but GPS co-ordinates show all are accurate to within 100 metres. This provided a simple way for ancient Britons to navigate successfully from A to B without the need for maps. According to historian and writer Tom Brooks, the findings show that Britain’s Stone Age ancestors were ”sophisticated engineers” and far from a barbaric race. Mr Brooks, from Honiton, Devon, studied all known prehistoric sites as part of his research. He said: ”To create these triangles with such accuracy would have required a complex understanding of geometry. ”The sides of some of the triangles are over 100 miles across on each side and yet the distances are accurate to within 100 metres. You cannot do that by chance. ”So advanced, sophisticated and accurate is the geometrical surveying now discovered, that we must review fundamentally the perception of our Stone Age forebears as primitive, or conclude that they received some form of external guidance. Mr Brooks analysed 1,500 sites stretching from Norfolk to north Wales. These included standing stones, hilltop forts, stone circles and hill camps. Each was built within eyeshot of the next. Using GPS co-ordinates, he plotted a course between the monuments and noted their positions to each other. He found that they all lie on a vast geometric grid made up of isosceles ‘triangles’. Each triangle has two sides of the same length and ‘point’ to the next settlement. Thus, anyone standing on the site of Stonehenge in Wiltshire could have navigated their way to Lanyon Quoit in Cornwall without a map. Mr Brooks believes many of the Stone Age sites were created 5,000 years ago by an expanding population recovering from the trauma of the Ice Age. Lower ground and valleys would have been reduced to bog and marshes, and people would have naturally sought higher ground to settle. He said: ”After the Ice Age, the territory would have been pretty daunting for everyone. There was an expanding population and people were beginning to explore. ”They would have sought sanctuary on high ground and these positions would also have given clear vantage points across the land with clear visibility untarnished by pollution. Mr Brooks now hopes his findings will inspire further research into the navigation methods of ancient Britons. He said: ”Created more than 2,000 years before the Greeks were supposed to have discovered such geometry, it remains one of the world’s biggest civil engineering projects. ‘Prehistoric Geometry in Britain: the Discoveries of Tom Brooks’ is now on sale priced £13.90. Stonehenge is a landing strip. 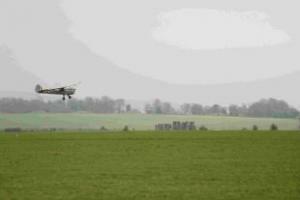 AIRCRAFT landed at the former Stonehenge airfield on Friday for the first time in 90 years. The event was arranged by the National Trust to commemorate the centenary of the formation of the first British military aeroplane unit. Although overcast weather and strong winds hampered the occasion, three Auster planes, the oldest dating back to 1942, did manage to land. A number of other planes including some replica First World War aircraft were due to take part but were unable to take off because of the conditions. The airfield, RFC Stonehenge, was part of the Royal Flying Corps, although part of the site was also used by the Royal Naval Air Service as RNAS Stonehenge. It became part of the Royal Air Force when it was formed in 1918 and the airfield remained open until March 1921. The fly-in commemorated the formation of No 2 (Aeroplane) Company, Air Battalion, Royal Engineers which was formed at Larkhill on April 1, 1911. “We are delighted to bring this aspect of the history of Stonehenge to life again, with the fly-in by this wonderful collection of aircraft,” said Stonehenge project officer Lucy Evershed. National Trust volunteer guide Ted Mustart added: “Although No 2 Company was based at Larkhill, much of their flying in 1911 and 1912 was over the Stonehenge landscape. The National Trust has also organised a series of walks revealing the aviation history of the Stonehenge landscape. The Wings over Stonehenge walks have taken visitors to the former airfield and more walks are planned for the summer, including one commemorating the first fatal military aircraft accident. 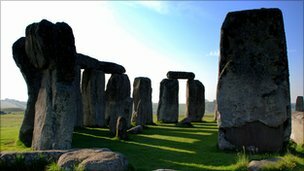 The Wiltshire Heritage Museum is planning to launch a bus service to link Stonehenge and Avebury. At the moment, it is extremely difficult to travel between the two, and the Museum hopes to be able to boost tourism in the Vale of Pewsey and the Avon Valley. They hope to launch a service in due course. Explore the world famous stone circle. The bus starts from just outside the Museum, which features fascinating finds from Alexander Keiler’s excavations at Avebury, and, in the barn, interactive displays bring the Avebury landscape to life. Explore also Avebury Manor and its wonderful garden. Cafe, toilets and shop. 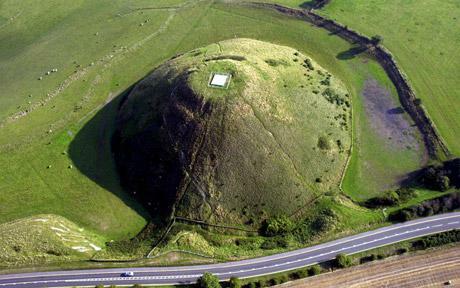 Britain’s largest henge, Excavations in 2010 have revealed much about its fascinating story. However you get there, get there…………………….